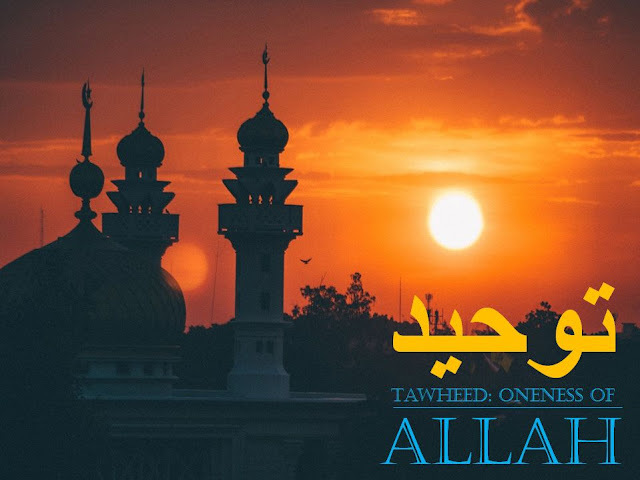 Concept of Tawheed in Islam- The Oneness of Allah ~ Islam My Ultimate Decision . Faith in oneness of Allah is the foremost pillar of Islam. Although all Divine religions since the Prophet Adam (peace be upon him) have revolved round the concept of oneness of Allah, there seems to have been some deviation in the concept of belief regarding God in Christianity. The concept of Trinity negates the very concept of oneness of Allah and divide the concept of God into three. Islam and followers of Old Testament (Torah) however strongly believe in oneness of one trued God, called in Arabic: Allah. The above surah lays down the foundation of the concept of absolute monotheism and dispels any notion of there being any equal or comparable to Allah and amply clarifies there is only Allah, like the God of Jews. But not like the God of Christians which also shares the title with two other. This, however, does not mean that the three leading religions of Jews, Christians and Muslims worship a different God , because all religions believe in One True God, though with passage of time the term has assumed different meanings due to distortions and man made beliefs and interpretations. We Muslims thus believe that there is no plurality of gods, as the polytheist society of Makkah believed before the advent of Islam. The Holy Quran thus clearly asserts the existence of a single and absolute truth that transcends the world; a unique, independent and indivisible being, who is independent of the entire creation. Allah, is a universal God, rather than a local, tribal, or parochial one for Allah is an absolute, who integrates all affirmative values and brooks no evil. Tawheed in nutshell is analogous to the monotheistic concept of God in Judaism, as declared in the Shema Yisrael, the Jewish declaration of faith. Tawheed is also analogous to Christian Unitarianism adhered to by a minority of Christian denominations which reject a trinitarian position of God in Christianity, which is in contrast to most Christian faiths that ascribe to the Trinity (God as three persons in one being; the Father, Son, and Holy Spirit). Narrated Ibn `Abbas: When the Prophet sent Mu`adh to Yemen, he said to him, You are going to a nation from the people of the Scripture, so let the first thing to which you will invite them, be the Tawheed of Allah. If they learn that, tell them that Allah has enjoined on them, five prayers to be offered in one day and one night. And if they pray, tell them that Allah has enjoined on them Zakat of their properties and it is to be taken from the rich among them and given to the poor. And if they agree to that, then take from them Zakat but avoid the best property of the people. Therefore it is mandatory for all Muslims, specially the reverts, to know the concept of Tawheed and FIRMLY believe in Tawheed - To acknowledge Oneness of Allah, who is away from likeness and numeration and he is not divisible even in imagination. Allah must be recognized as The Lord or The Master and that He is so absolutely pure and above nature that nothing can be added to or subtracted from His being.